Please join us this Saturday at the opening reception for this exciting new exhibition by Robert Weibel. This new series is an array of wooden figures and drawings representing Weibel’s mythopoetic exploration of people and animals, real and imagined. Known for images he creates by igniting gunpowder on paper, Weibel has been exploring new mediums and materials and for this series he has created a menagerie of animal totems and spirit guides. 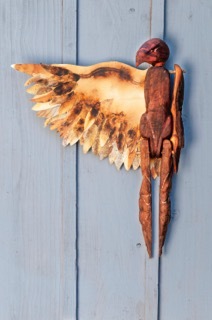 The wooden figures range in size from a few inches to several feet, and have been rustically carved, assembled and painted out of found wood and other materials. 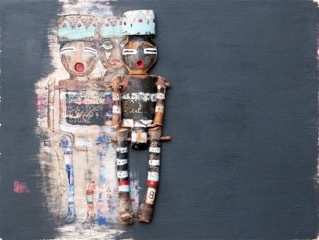 Many of the figures are mounted on painted wooden backgrounds and some figures include masks. On one piece, the artist enlisted collaborations from artist/welder Amy Kohl, artist/woodworker Jim Campbell, and costume designer Ginger K. Lewis-Reed to complete the three foot wood and metal figure with embellishments. The move from creating 2D to 3D work began after several trips to the Southwest where he became inspired by the artistry and simplicity of early Spanish Catholic icons and Hopi Kachinas (Katsinam). The series represents 3 years of development and Weibel is enthusiastic about sharing it with the public. He is scheduled to be in the gallery for three separate events.